The holiday season inevitably means congested roads and back-to-back traffic as Americans go about their holiday shopping, party hopping and trips home to family. But with the rising cost of gasoline, this hustle-and-bustle can come at a significant cost. There are more than 250 million cars on the road in the United States, which is more than one per American adult. The United States uses one-fifth of the world’s oil to fuel those cars. 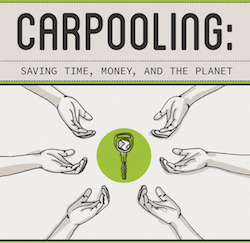 Just 10 percent of Americans choose to carpool, saving a collected 85 million gallons of gasoline, avoiding 56,000 miles of traffic and saving $1.1 billion on gas and car costs per year. For more carpooling facts, check out the full infographic after the jump. My brother got married last weekend in Los Angeles, which meant that I had to fly out Thursday night and back to New York City on Sunday. Rather than deal with getting off a long flight and renting a car from the airport — I didn’t think navigating an unfamiliar city at midnight when your body thinks it’s 3 a.m. was the best idea — I cabbed it to my hotel and retrieved a Zipcar the next morning. I’d also been meaning to test out the Zipcar iPhone app, which lets you unlock your rental straight from the phone. This seemed like the perfect time to give it a whirl. Make sure you still bring your Zipcar membership card. Once you activate the app, you need to unlock the car first with your membership card by waving it over the designated area on the windshield. Next, you have to enter your membership number into your phone. Don’t know your number? It’s on your membership card. Though these preliminary steps seem to defeat the purpose of ditching the membership card, your iPhone is now all set to start unlocking and locking your car. Using the iPhone app to unlock the car isn’t always the most efficient. There were a few times when it took longer to unlock the car with the iPhone — as in, it was much faster for me to open my bag, dig out my wallet, and wave the key over the windshield. Once the novelty wore off, I ended up using the keycard about half the time and the iPhone app for the other half. Zipcar isn’t necessarily the cheapest option, but it can be more convenient. My two-day rental cost about $180, including gas and insurance. And unlike major car rental agencies where you reserve a certain vehicle class, Zipcar lets you call dibs on a specific make and model, so I knew exactly what I was getting. The last time I was in L.A., I used Zipcar to rent a Mini Cooper. Unfortunately no Minis were available on this trip, so I settled for the Toyota Prius. Zipcar requires a $50 membership, which I auto-renew each year. Unfortunately, I’ve only used my membership once so far this year, so I haven’t yet maximized the value. If I factor in the membership cost, the two-day $180 rental increases to $230 — pricey. Tack in the $50 cab ride to and from the airport, and you’re looking at $330. But I’ve long believed that traveling on a budget isn’t always about finding the cheapest price — it’s also picking the smartest option to reduce your stress level. And since I was traveling to my brother’s wedding, I figured it was worth paying a little extra money to preserve my sanity. The Bottom Line: Consider the Zipcar app as an alternative to your keycard, not a total replacement. I will say the app is good for at least one thing — making sure that I didn’t leave my cell phone in the car (or lose it). Will the Toyota recall affect your next car rental? Toyota‘s massive recall due to faulty accelerator pedals is trickling down into car-rental companies. How does the recall affect your next rental? I checked in with some of the major players to see how they’re handling the recall, now estimated at more than 9 million worldwide. Dollar Thrifty: The recall represents less than 1.5 percent of the overall Dollar Thrifty fleet. “We have currently grounded the vehicles and are working with Toyota on inspection of the vehicles and a proper resolution of the issue. We do not have any significant Toyotas on order,” Scott Thompson, president and CEO of Dollar Thrifty Automotive Group, said in a written statement. Zipcar: Toyota’s recall affects about 5 percent of the Zipcar fleet. The car-sharing company isn’t taking new reservations on any recalled vehicles, which include the 2009 and 2010 Toyota Matrix. If you already have a reservation on a Toyota Matrix, Zipcar will move you to a different car and compensate you for any rate difference. If you’d rather bail, any cancellation fees will be waived. For questions about upcoming reservations, call Member Services at 866/494-7227. The silver lining: Many car-rental companies, such as Avis, Budget, Dollar, and Thrifty, only let you reserve a certain vehicle class (compact/economy, mid-size, full-size). Since you weren’t able to specify a make/model to begin with, at least you won’t have to deal with re-booking because the car you wanted is suddenly unavailable. In general, car-rental companies had already been shrinking its fleets, which was resulting in higher prices. We’ll keep an eye on how this will affect pricing now that the supply is even smaller. I’ll also update once I hear back from Hertz, Enterprise, Alamo, and National. Zipcar — the carsharing service that rents vehicles by the hour or by the day — is expanding into Massachusetts. The expansion is taking place in Malden, Quincy, Newton, and Braintree at the Massachusetts Bay Transportation Authority’s T locations along the Green, Orange and Red lines. This is the first time a transit agency has agreed to keep some of Zipcar’s vehicles at transit stations. Exact location are listed in the press release, and more vehicles will be coming in the next few months. Of course, since the vehicles are parked at the train stations, this makes Zipcar an attractive option for travelers who don’t want to bother with “traditional” car rental hubs. The only downside? You have to be a Zipster to use the service.